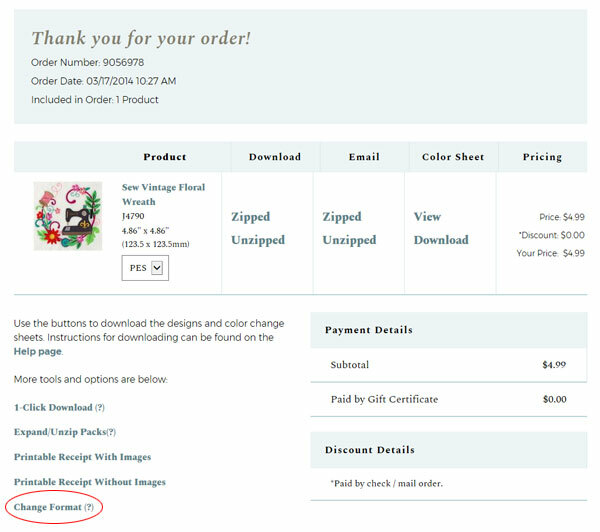 You can change the format in your order history at any time, and download the designs in a new format. This is especially helpful for those that have two or more machines that use different formats, or those that buy a new machine that uses a different format. The steps below show how to change the format for a single design, an order, or your entire order history. To change the format for one design, select the format from the drop-down box. Then download the design in the new format. If you'd like to change the format for an order, or your order history, then click the "Change Format" link in any order. 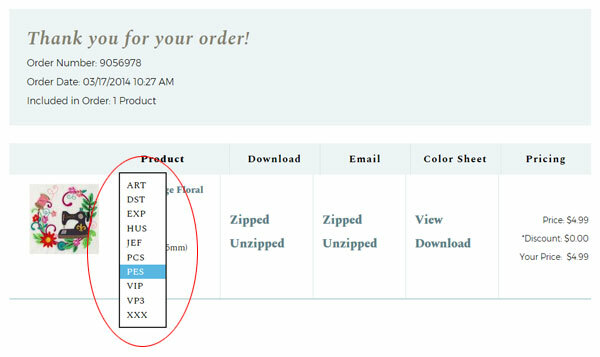 Change the format for the specific order, or your entire order history, then click a button to "update." After the website finishes changing the format (which takes a few seconds), you'll be returned to your order history page. 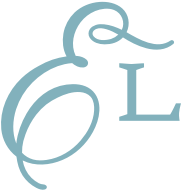 Download the designs in the new format. If a design isn't available in the requested format, then the format will not change for that design.